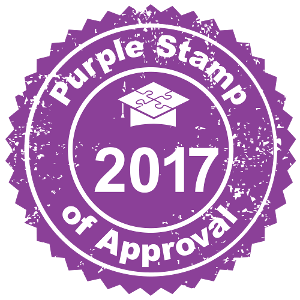 Super Teacher Worksheets has recently been awarded the Purple Stamp of Approval from HomeschoolBase.com. We are extremely pleased to be among those teaching resources Homeschool Base honors as "exemplary websites, programs, and products that offer quality, innovative, unique, cost-effective, or significant value to homeschooling families." Find Super Teacher Worksheets on Homeschool Base's Top 10 and Top 100 of 2017 lists. Thank you, Homeschool Base, for this generous recognition. Check out HomeschoolBase.com today and see Super Teacher Worksheets on their Top 100 of 2017 list!